GBNC is organizing a program to celebrate our greatest festival "Bijaya Dashami" with friends and families. 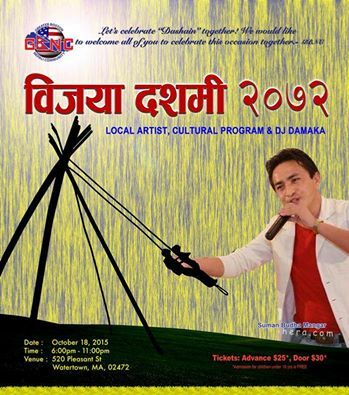 I would like to cordially invite everyone to attend the fun filled program with cultural dance, Nepalese Cuisine, DJ Dhamaka and more. Lets celebrate our festival together. Venue: Sons of Italy, 540 Pleasant St., Watertown, MA.